Oishiidesuyo , 1998, 17"	x 24"
colored pencils, and ink jet print on watercolor paper. 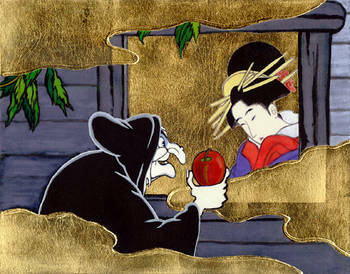 In this piece one can obviously draw parallels to tale of Snow White. Wherein the innocent fugitive that has sought refuge amongst newly found friends is enticed by a seemingly nice elderly and sagely woman. To the innocent woman the gift is not what it seems and entails unpleasant consequences. This parallel depicts the experience of those finding themselves in a new culture where something that is portrayed as being pleasant and beneficial is often an experience to the contrary. It is a universal of naively and trust being led astray by seemingly kind and warm-hearted people that in actuality are manipulative and unethical. In her artwork, Fujiko Isomura often uses traditional and modern cultural icons to express her own experience and ideas of living in the diverse cultures through her whimsical style. - C.R.